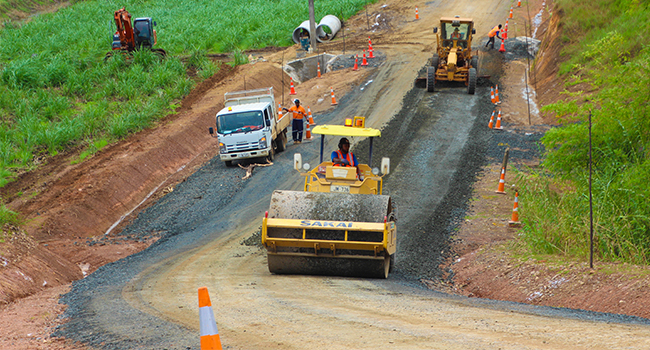 The Fiji Roads Authority is carrying out maintenance work on Daku Road in Labasa. Just forty kilometres outside Labasa Town on Wainikoro Highway, the road is undergoing backfilling and stabilizing work. Daku Road has been used for many years by nearby residents as it connects the Wainikoro Road to Natewa Bay West Coast Road. Due to the heavy rainy season, the section has been washed out, creating an inclined hill on the road surface – posing a risk to sugarcane trucks, buses and other vehicles. A crew from Fulton Hogan Hiways have been working to remove high shoulders, as well as improve existing drainage, backfill the inclined hill with aggregates, grade and compact the road with a roller and cement and, finally, stabilise it with a final coat seal. Over 200 cane and vegetable farming residents, three schools and several villages depend on the road daily. Resident and sugarcane farmer, Mukesh Ghana, says it has been a welcome relief to farmers as it is cane cutting season and this upgrade, although not completed yet, has already made it easier for farmers to transport cane.